This is a bit of a departure for me. It's a review of a brand in general, and not so much about a particular restaurant location. Written for a website that promotes franchising of fast food businesses, I followed their lead but in the end it wasn't their style - too 'bloggy' it turns out. So here you go, guys. A Foodie Spy Mission - Going Undercover To Scope Out the Quiznos Menu! 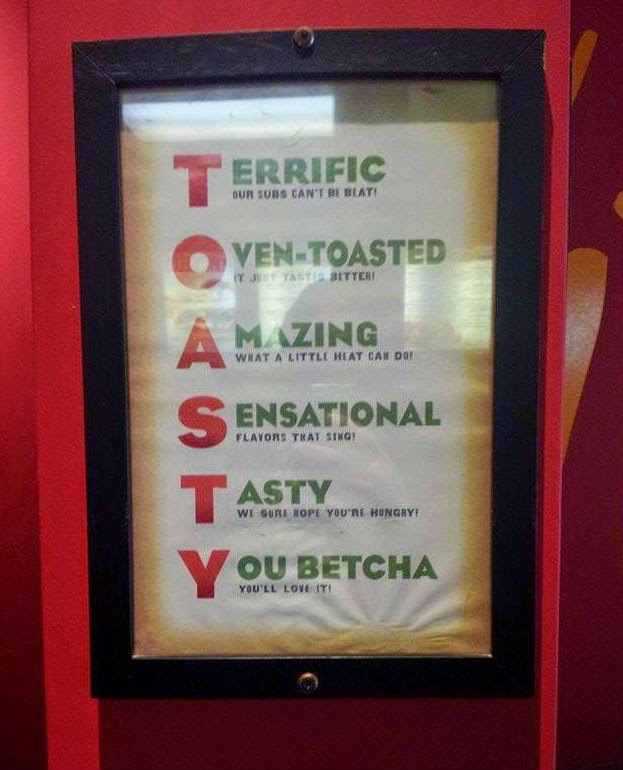 Quiznos – mmmmm Toasty! That's the current slogan accompanying their TV commercials these days. I have been on a mission recently to find out exactly how much mmmmm and how much toasty is actually involved in the Quiznos menu items offered by the sub sandwich chain. Until this week, I have never set foot inside a Quiznos. There is actually a location in close proximity to my home, so why haven't I gone in? The answer – one bad review. That's right one bad review from a family member, possibly 5+ years ago, that led to me never even trying the place for myself. Silly perhaps, but it certainly underlines the value of word of mouth advertising. Give one customer a bad sub and you will potentially lose two or three new customers. So what was the family member's complaint? He said the sub tasted “off” as in something had gone bad. Ooooh nasty! However, I'm willing to bet that the customer in this case might have been unused to Quiznos particular flavours. Perhaps their usual cheeses are more pungent than the cheeses used at say Subway or Mr. Subarine. If your mouth is expecting one flavour, and you get another, you might experience a bit of palate shock. I'm donning my detective hat now to check it out for myself! So it's been about 5 years since my family member – okay, it's my husband – has been in to have a bite at a Quiznos. Today, we took a willing victim with us, our twenty-something son, and headed off to the nearest Quiznos location just after it opened for business at 11:00 a.m.
Two friendly female counter attendants were busily finishing their lunch set up when we arrived. I bet they could tell we were not regulars! We are used to another submarine sandwich chain restaurant popular in this area, so we were a bit lost and I'm sure we looked it. We were still stumbling over our sandwich preferences when the young ladies asked us if they could help us. They weren't pushy at all, in fact very understanding of our newbie-ness! At our other sub shop, all the fixings are displayed in steel inserts behind a glass window, so we were somewhat at a loss visually since Quiznos keeps their sandwich fillings behind a stainless steel wall. 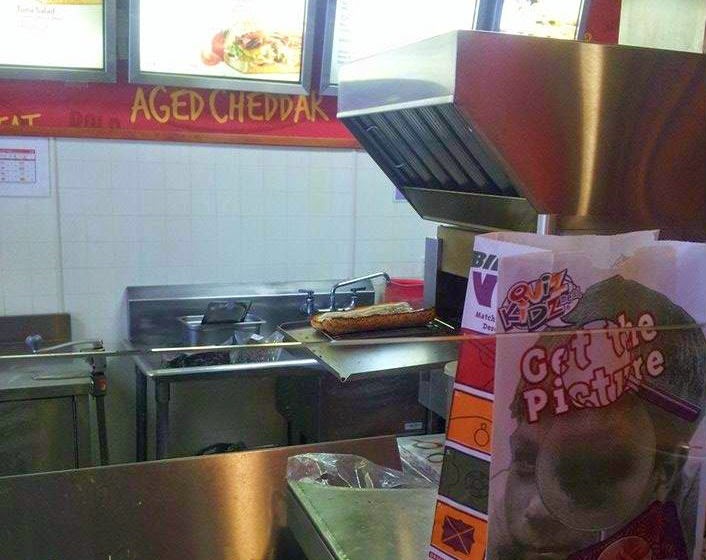 The attendants can see the food items, but the customer cannot. I felt rather blind. The husband ordered the Beef & Swiss Melt on the rosemary parmesan bread. The other choices were white or whole wheat (brown) bread. The nice thing, not seen at other sub places we frequent, was 3 choices of sub length, not just 2 – 6 inch, 9 inch or 12 inch. The three of us chose 9 inch just because we could! I ordered Tuna Salad on rosemary parmesan and the son ordered Turkey Bacon Guacamole on the same bread. We were offered a few choices of cheese and if mushrooms were wanted, and such, then we were moved down to another counter area to choose veggie toppings. At first, I thought this was weird and rather unnecessary but then I realized that the sub goes the through the big toaster oven before getting the cold toppings added. Ah - makes sense now. I got a cup sized (6 oz.) bowl of Broccoli & Cheese soup. There is a bigger 10 oz. size too. We took our lunch to a table near the window to eat and to analyse. I must say the slogan mmmmm toasty does apply. Our subs were really nice and crispy and they never lost that crunch even as the last bit of crust disappeared. The boys were thrilled with their lunches. No complaints about off tasting meats from the husband. The son said the meat was really fresh and it reminded him of a deli in the town where he went to college, where they sliced the meat right in front of you and made killer sandwiches. Indeed, you could see state of the art looking meat slicer on the back counter, and between customers, the counter girls sliced meats and cheeses. And my lunch? Meh. The soup wasn't that great. Okay, I did say that if it wasn't all that hot yet (they had just opened), I would be okay with that, but I didn't mean cold! Still, I could the gist of the flavour, which I would describe as Cheeze Whiz with broccoli in it. It was more or less what I expected, for a fast food place not awful but not spectacular either. I am just daft enough to eat it again. But hot this time! Well, that was the soup, now the sandwich went from pleasant surprise to let-down. You see, I have been studying the menu on quiznos.ca in preparation for this project, and nowhere does it mention tuna. I eat a mostly vegetarian diet, and I usually get either egg or tuna salad from that other sub place, so I was kind of bummed that I wouldn't be able to have those choices at Quiznos. I was expecting my lone option to be their Veggie Deluxe sub. I was already a bit put off at the thought of paying the same price for a cheese/veggie sub as a cheese/veggie/meat sub while getting ripped off for protein. So seeing Tuna Salad made my spirits lift. Wouldn't you figure anything with the word salad in it would consist of more than one ingredient? The filling seemed to me to be pretty much tuna straight out of the can. Dear Quiznos, if there's any mayo in your tuna salad at all, you need more. All that being said, I think I would go back again. I really didn't know what I was doing on this visit. Next time, I would ask for more mayo and some salt and pepper to bump up my tuna. I love the names of the sauces! They sound almost chef inspired, don't they? Actually, they are. 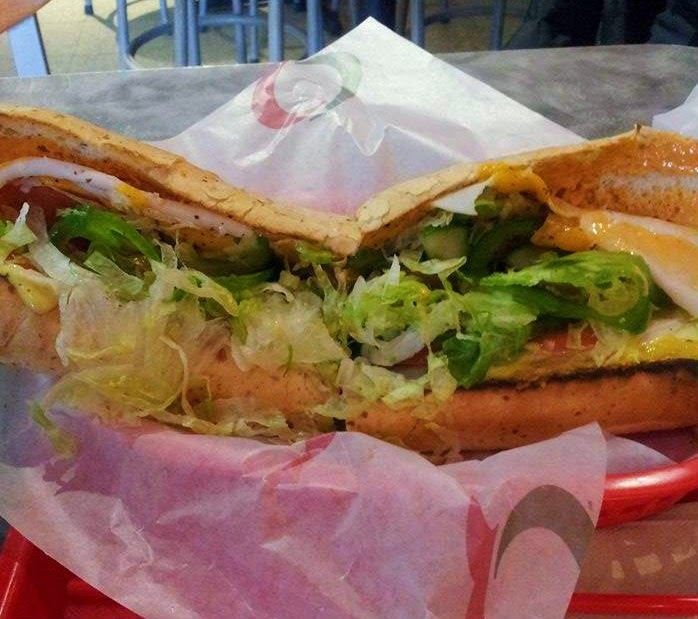 Back in 1981, the very first Quiznos was opened in Denver, Colorado by Jimmy Lambatos, who was already a skilled chef. He brought his more haute cuisine sort of flavours and sauces to the fast food world along with the idea of using real, freshly sliced sandwich fillings on artisan breads and then toasting the whole thing until bubbly and crispy. It was a near instant hit and franchising was a no-brainer, which began only 2 years later. 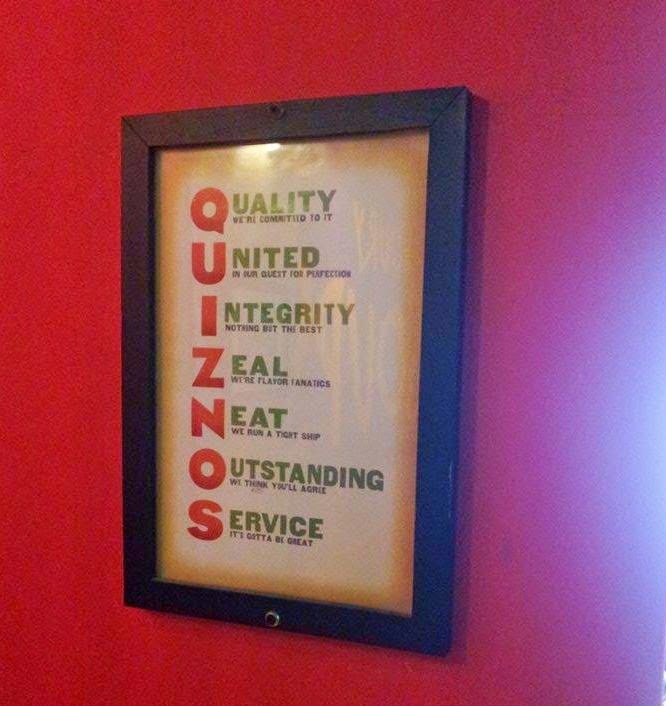 The Quiznos chain spread like wildfire, hopping all across the U.S.A. and into Canada, Japan, Mexico and the U.K. The money rolled in and they all lived happily ever after ... or did they? The fairy tale that is Quiznos has had some dark days. The sun is shining again, but the clouds might return yet. The villain that suddenly appeared in Quiznos' story one day, was the same villain that wrecked many a lovely tale – the economic recession of 2008. Quiznos had been been happily skipping through the forest until bam! the big bad monetary downturn attacked without mercy. Suddenly, the story was all about competition for dollars. No longer would consumers be willing to pay more money for toasted subs with a bit more meat, when the other sub place charges less. Simple math. Let's look at 2 meatball subs, both 12 inches long with what seems to be identical ingredients (to the consumer anyway). At Quiznos it costs $7.49. At the other sub shop, it's $5.50. Not all of the price gaps are so wide, but I think there's a perception among consumers that Quiznos is a pricier place to buy a sub. Scrappy Quiznos, unlike many other businesses, survived that challenge but made some missteps a few years later by jumping on the eat healthy bandwagon, which entailed ditching some of its cheaper subs from the menu. Then, their upscaleness (if that's a word!) in the sub sandwich world began to be eaten up (pun intended) by new kids on the block such as Panera. So the other place is cheaper ... and Panera is fancier ... so where does that leave Quiznos? In June, 2014, Quiznos found itself declaring bankruptcy. That usually spells the beginning of the end, in fact quite often the bankrupt business is never heard from again. However, Quiznos rose like a phoenix from the ashes, out of bankruptcy only 4 months later. Not bad, Quiznos, not bad at all. Once upon a time, Quiznos had some 5000 locations. They are a much leaner organization today with less than half of that peak 2007 amount. They are taking baby steps into new territories like Singapore, Indonesia and the Philippines. Quiznos also had a nasty battle in the courtrooms with some of its franchisees, who had felt like they were badly treated by the parent company. One of those suits was settled in 2009 by giving the franchisees $95 million (ouch! ), but another suit arose in 2013. It must be difficult to concentrate on refreshing, rebuilding and restructuring a business with court cases pending. The Quiznos restaurant that I visited with my family was nice and bright and clean. 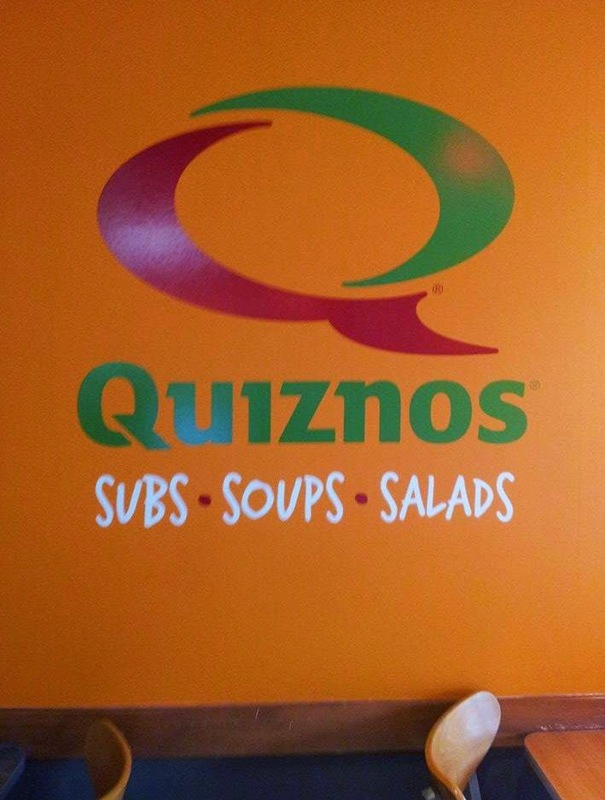 The accent wall across from the counter was painted a cheerful tangerine colour and emblazoned with the giant Quiznos 'Q'. You can choose to sit at a regular table, most with 4 chairs, or at a high table with bar stools. There is a hot pepper bar near the front entrance, which I thought was kind of cool, with jalapenos, banana peppers and more – a nod to their southwestern U.S. origins. That certainly makes it different from the other sub places. Near the do-it-yourself soda pop fountain, there was a huge glass bowl of a drink dispenser, filled with swirling pink lemonade a la old fashioned soda shop style I thought. Quiznos has extras like cookies, chips and bottled drinks just like their competitors do. Yes, they also offer catering. Kids meals? Check. So what might they be missing? A breakfast menu is something to consider. Quiznos already has the ham, cheese, steak and flatbreads in stock, why not invest in some eggs too?